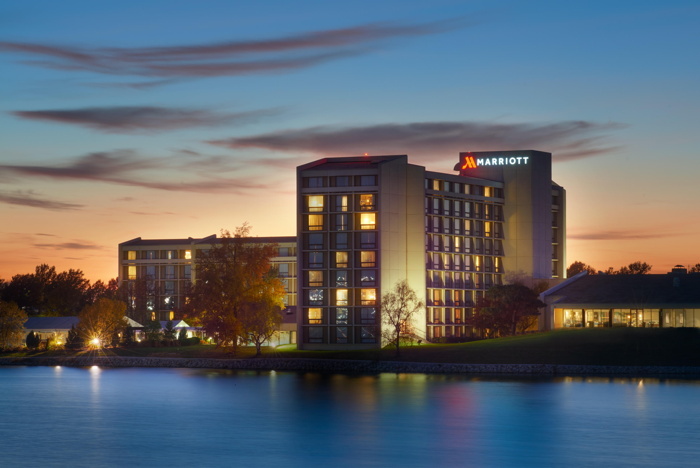 The Hotel Group celebrated the completion of the multi-million-dollar transformational renovation of its Marriott in Kansas City, Missouri, located at 775 Brasilia Avenue. THG’s multi-million-dollar renovation includes upgrading all guest rooms and suites with 55" flat-panel TVs, specially designed work desk that will allow guests to stay productive, luxurious bedding, hard surface flooring, updated bathrooms with a barn door and modified storage option in an open closet area. The updated M Club located on the lobby level offers guests ideal space to work, recharge, connect and relax while being able to enjoy a quick snack. Exclusively at the newly updated Marriott, KC tap+table restaurant has partnered with locally-sourced Kansas City flavors and house-made ingredients to provide patrons with the freshest products and ingredients. Guest will enjoy seasonal outdoor seating overlooking the Berlin Reservoir from the 70-seat lounge and 64-seat restaurant showcasing a double-sided 12 beer tap tower featuring locally crafted ales along with wines and spirits. The restaurant boasts a 46-seated elevated and lower level outdoor patio dining area with a fire pit and a unique view in Kansas City. THG kicked off its renovation celebration on April 11th with a ribbon cutting ceremony and travel themed entertainment from around the world, followed by tours of the 381-room property. More than 600 guests mixed and mingled at the celebration, which featured opening remarks by Douglas Dreher, President & CEO of The Hotel Group. THG’s founders Edmond and Barbara Lee were joined by, Doug Dreher and wife Maria, Randy Meyer, THG’s CFO, Robert Avila, Senior VP, THG’s Corporate Marketing Director Theresa Benson, and General Manager, Jim Wynn, Director of Sales Carolyn McClure and several other key people for a ceremonial ribbon cutting. Aerialist acrobats wowed guests with stunts and guests toured the hotel to enjoy additional travel themed entertainment. The Marriott KCI is located minutes away from the Kansas Speedway, Nebraska Furniture Mart, Kauffman Stadium home of the Kansas City Royals and Arrowhead Stadium home of the Kansas City Chiefs. The 381-room full-service property features over 14,000 square feet of versatile meeting space including twenty-one meeting rooms ideal for business gatherings, social events or weddings. It is the only hotel located on airport grounds, 20 minutes from downtown Kansas City and has easy access to shopping and dining.